Technically, they are a tender perennial but they are usually considered an annual plant by growers and seed producers. 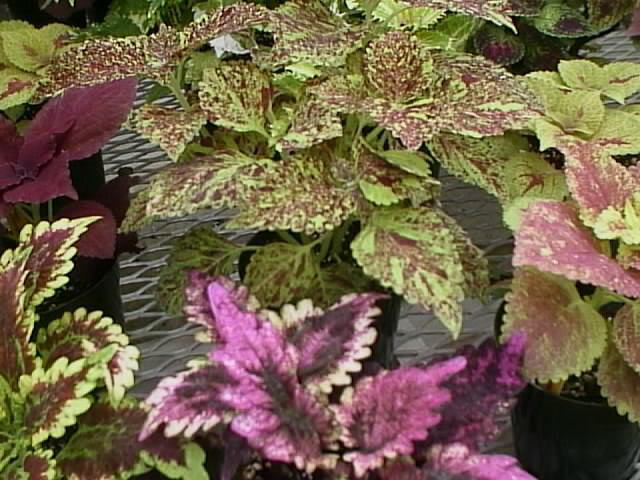 Coleus plants should be grown in the garden in bright, indirect light, or in partial shade. The lower growing dwarf varieties (6-12 inch) will create a colorful border, or you can use the taller (up to 36") types as a dramatic background planting. Many Coleus plants will survive full sun exposure but the foliage color is often enhanced when they are grown in the shade. 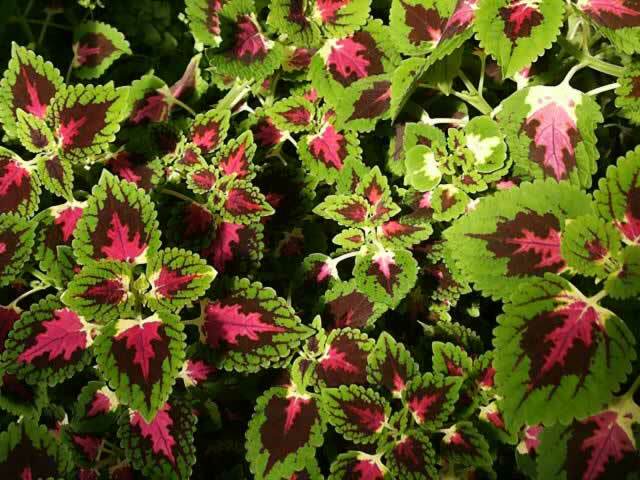 By removing the flower spikes as they develop, and keeping the plant pinched back, the Coleus can be kept growing as a perennial for several seasons. These plants are a member of the nettle family but they are also a mint. They do not have the stinging properties of the common nettle. Coleus plants are sold in a variety of sizes ranging from bedding "six packs" to massive specimen sized hanging house plants. The small starter plants may seem bland and fairly colorless when compared to the larger specimens, leading you to grab for the big, fancy one. Even though you may think that your new thirty dollar plant has to be the most colorful and beautiful Coleus ever, never underestimate the potential of a Coleus seedling! Once the seedlings reach a certain point in their growth, they will develop additional coloring and foliage characteristics. The intensity of light which the plant receives will also have a direct bearing on the intensity of the foliage coloring. Some varieties may produce their best color in light shade, while others look best in bright lighting. Florescent "grow" lights seem to bring out even more intense and vibrant coloring. Unless you have an immediate need for a BIG house plant, you will be better off to choose a variety of the smaller ones, and watch them grow and develop. 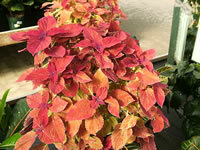 Coleus make nice house plants as long as they receive sufficient light and food. Your Coleus should be planted in a light, quick draining, commercial potting soil. Place it where it will receive several hours of bright light (south window) each day, or provide artificial "grow" lighting for best leaf color, and fullest plant. Coleus plants will adapt to a wide range of temperatures above 55 degrees, but will grow best when they are kept between 70 and 85 degrees. Keep the soil evenly moist, but never soggy. Feed your Coleus plants monthly, with a diluted (50% mix) liquid house plant fertilizer. Flower buds must be pinched off as soon as they develop to prevent the plant from producing seeds. (The flower spikes are very insignificant anyway....) Once a Coleus is allowed to go to seed, it has completed it's life objective, and it will usually die. Pinching may also be necessary to prevent leggy growth. Any time that the tip growth is removed, the plant's energy will be diverted to the lateral side growth, creating a much bushier plant. Coleus are very durable, so you can cut your plant back severely if needed (almost back to the soil level). Coleus plants should not be set into the landscape until the minimum outdoor temperature is 50 degrees F.
Although Coleus plants will usually survive in full sun, the foliage color tends to intensify in light shade when they are grown outdoors. Plant them twelve inches apart in rich, moist, well-drained soil with a neutral or slightly alkaline pH. Feed monthly with a liquid all purpose (10-10-10) fertilizer. Pinch the center stems out when the plants are 4 to 6 inches tall to induce bushier growth, and be sure to pick off the flower spikes as they form. If the soil is allowed to dry out, the foliage will wilt, but normally will recover quickly when additional water is provided. Water your plants thoroughly at planting time, and then mulch the entire bed to conserve moisture. The mulch will also help to heat up, and retain the heat in the soil, thereby helping your plants to get established in their new home. Watch out for mealy bugs, aphids and whitefly, as well as slugs and snails! Growing a Coleus collection from seed is really quite easy and quick. Seeds are inexpensive, readily available and can be sprouted and showing their first colors in as little as two weeks. Another advantage to growing your Coleus this way, is that each packet of seeds will contain many different colors of plants. Seeds from different producers may include different hybrid varieties as well. If your intent is to grow your Coleus as a house plant, the seed can be sown indoors, at any time of the year. If the seedlings are destined for a garden location, they should be started indoors, at least 10 weeks before your last expected frost, so that the plants will be well developed when it is time to plant them outdoors. Coleus seeds are very small. They should be sown onto a layer of moistened, sterile potting soil in a shallow tray, and then covered with a thin layer of fine soil. The tray should be covered with a pane of glass or sheet of plastic to retain moisture, until the seeds have sprouted. Keep the tray in a warm (65-75 degree F.), bright (NOT full sun) place. When the seedlings are large enough to handle easily, they should be thinned out and transplanted into individual pots. Seedlings should only be held by a leaf, never by the stem! When all danger of frost is past the plants may be set out in the garden. You can create an identical clone of your favorite Coleus by taking softwood stem cuttings at any time of the year. If you take cuttings in the fall, prior to a killing frost, and grow your Coleus as a house plant to brighten the winter months. In February or March take several cuttings and cultivate them for transplant into the garden when the weather warms. 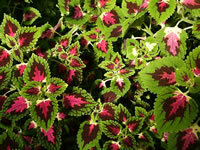 Older Coleus plants tend to become leggy, and the foliage color will begin to fade. Propagation by cuttings will do a lot toward renewing most older plants, but the "cloned" baby will quickly become the better plant.